Phenolic resins are important raw materials in many rubber formulations. They are used to improve the processing and performance of a wide variety of rubber products. They are also important ingredients in rubber components for the automotive industry including tyres, belts and hoses. Tack is the property of adhering rapidly and strongly when two uncured rubber surfaces are brought into contact. Besides tyres, anywhere where multilayer rubber products are manufactured, a green tack is the essential requirement for assembling these multilayer rubber components. Most synthetic elastomers do not possess the building tack, or autohesion which natural rubber inherently possesses. 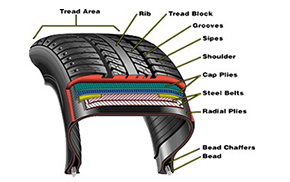 Products such as tyres, belts and hoses, which are manufactured by laying up plies of unvulcanised, compounded elastomers must however contain the necessary amount of building tack for pre-cured adhesion to the plies. This tack must be incorporated into the synthetic elastomer by the addition of a resinous polymer, generally referred to as tackifier. Selection of tackifiers depends primarily on softening point, composition and molecular weight. The tackifiers can also be used to improve the compatibility of other adhesive additives. A number of tackifiers are available, however phenolic tackifiers are the most efficient because they impart initial tack together with a high degree of tack retention. High initial tack with improved tack retention. Better heat and humidity performance. Lower loading levels required to achieve the same degree of tackiness in the rubber compounds which in turn gives the compounds comparatively less heat build-up. Reinforcing resins are used to increase the performance characteristics of rubber goods, such as tyres, belts or any other technical rubber based products. 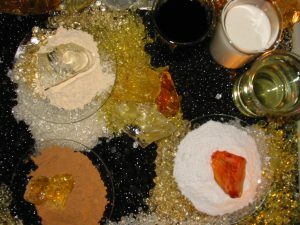 This type of reinforcing phenolic resin undergoes a self-condensation reaction (will not cross-link with the rubber) in combination with curing agents (e.g. a methylene donor such as hexamethylenetetramine or hexamethoxymethylmelamine). Often this type of resin is modified with tall oil or cashew nut shell liquid for enhanced solubility in rubber. During processing reinforcing phenolic resins function as a processing aid by lowering the compound viscosity. However, during vulcanization they form a tri-dimensional network in the compound, imparting resistance to chemical and solvent attack, improved ageing characteristics and increasing the tensile strength, modulus, tear resistance and hardness of the vulcanized stocks. These resins improve the abrasion resistance, initial tear strength of the rubber products with better stiffness and toughness, along with reduced residual compression set and better heat, oil and solvent resistance. The long hydrocarbon chain present in the modifiers provides better solubility in rubber. Unmodified phenolic resin is extremely polar which limits its rubber compatibility to primarily high ACN nitriles. The modifier acts to make the cured phenolic resin more pliable. This gives the final product more flexibility, especially at higher temperatures, than an unmodified resin (similar to a rubber providing better impact resistance to a plastic). Dynamic properties are enhanced. Chemical resistance to acids and bases is improved due to the water resistance of the “fatty” hydrocarbon chain.